When there’s a party, there’s a cake! The cake is one of the must-haves when you’re going to host a baby shower. Of course, we have the showstopper – the mum-to-be – but we also need her sidekick, and that would be the gorgeous cake. Baby showers can be adorned with a lot more than just a normal cake. You could choose cupcakes, ice cakes, cold cakes, and whatnot. MomJunction brings you a list of all those nice and sweet things you can bake and serve in the party and win hearts and love! 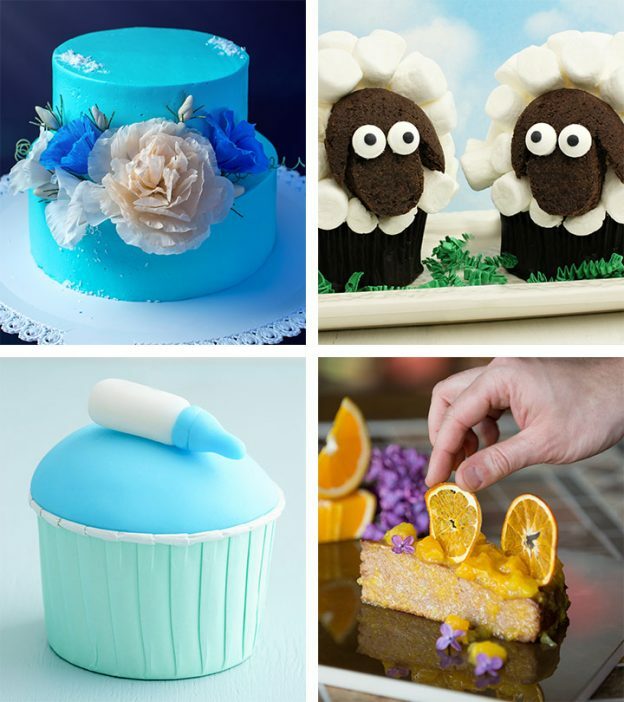 Your cakes could be tasty and colorful, multi or single flavored, or maybe just straight and simple. But add some fun into them and see how your guests will enjoy that. Below we bring you some fun cakes. Bibs are a must-have for a baby. So make the mom-to-be prepared for it with a bib-like cake. Put the cake on a board and trim the top of the cake and level it out using a bread knife. Use a cookie cutter to cut off a small chunk of the cake from the top center, which would be the round region near the bib. Cut off the center that leads to the top of the cake. This would make it look like the neck in a bib. Cut the fruit into the shapes of ducks or elephants, using a cookie cutter. Mix the dark chocolate frosting and neon orange frosting together and spread it on the top of the cake using a spoon. Mix some dark chocolate and pink food coloring together and spread it on the sides of the cake. Save some dark frosting in a zip lock bag. Add the chocolate chips on the borders of the cake. Arrange the snow caps near the neck of the bib. Arrange the ducks or elephants at the bottom of the cake. Using the dark frosting, you could write ‘Baby’ or another phrase on the cake. You can even give the ducks and elephants eyes, with the same frosting. 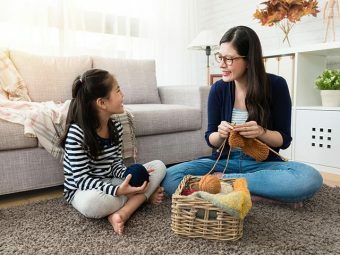 There is nothing that can replace the warmth of a mother, but blankets do come quite close to that. A blanket cake is not just cozy looking, but yummylicious too! So, why not try it? Put the cake on a board and using a bread knife, trim the top of the cake and level it out. Spoon half a cup of frosting into four separate bowls and add the desired food color in each bowl. Scoop out a little bit of frosting from each of these and seal it in separate zip lock bags. The rest of the frosting should be spread on the top and sides of the cake. You could alternate between colors and make it look like a lovely blanket. Mark big squares on the cake and fill them with vanilla frosting. Add chocolate chips to all the corners of the squares. Press the spice drops into flat structures and cut them out with the help of cookie cutters. You can decorate the cake with vanilla frosting. A little sour and a lot of sweet never hurt anyone. So, we present to you this amazing cake in a beautiful summer color. Add cornstarch, sugar, salt, and one-fourth cup milk in a bowl and whisk it up. Whisk the four egg yolks separately and then add them to the above mixture. Heat the remaining milk in a pan until small bubbles are formed. Make sure you don’t boil it. Slowly, add the heated milk to the above mixture while stirring constantly. The milk should not scramble the eggs so make sure it isn’t hot and you are pouring it into the pan slowly. Now, transfer the mixture into a pan and place it on medium heat. Continue whisking till it becomes creamy and smooth. This may take about five to seven minutes. Once it is off the heat, add in the lemon extract and some butter and whisk it once more. Allow the mixture to cool and then put it in the refrigerator. Once the cream is chilled, take it out of the refrigerator and smoothen it over the cake. After the fun frost and cream cakes, let’s look at some theme-based cakes. And yes, you guessed it right. Here we bring you some baby shower cakes for girls. So, if you want to announce the arrival of your little princess, we’ve got it covered. A beautiful cake that looks like swirls of happiness, this cake is a lovely mix of strawberries and raspberries. Mix the strawberries and raspberries in a blender. Once they blend well, heat it over a medium flame with one tablespoon water and frosting sugar. Beat two eggs in a large bowl and add all-purpose flour, butter, milk, and sugar. Whisk it well. After five minutes of letting the raspberry and strawberry mix simmer, transfer some of it to a piping bag. Add the rest of the berry mix to the whisked mixture and bake it at 180ºC for 20 minutes or till the toothpick comes out clean. Once the cake is ready, transfer it to a working table and let it cool. After the cake cools down, using the piping bag, swirl the berry mix on the cake in small waves. Cheesecakes are quite a thing at most celebrations. So, why not choose one to announce the little one’s arrival? Preheat the oven to 300ºF. Place strawberries on a baking sheet and drizzle some corn syrup on it. Toss lightly, so it mixes well. Bake the strawberries for about an hour and a half and once they cool, transfer them to a bowl and mash them. In a bowl, bring together the crackers, three tablespoons sugar, and one tablespoon cooking butter and mix well. Transfer the mixture to a springform pan and press it hard towards the bottom. Bake it at a temperature of 350ºF for ten minutes. The crust should be dark and hard when you touch. Reduce the temperature of the oven to 325ºF. In a bowl, add cream cheese and whisk it using an electric mixer for two to three minutes. Wipe down the sides of the bowl and add one cup of sugar and two pinches of salt. Add eggs one after the other and whisk well each time. There should be no lumps in the mixture. Transfer the above mixture to a bowl and add the mashed strawberries. Stir them together. Add this on top of the cracker mix and smoothen it with a spatula or spoon. Add a few scoops of plain cheese mixture on top of the above mixture and then smoothen it. Wrap the springform pan in two layers of foil and place it in a large roasting pan. Fill the pan with water, half way up to the length of the springform pan. Bake the cheesecake for about one hour and then cool it in the refrigerator for about four hours or overnight. 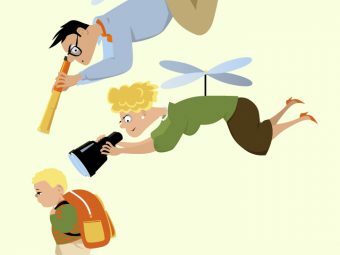 Declaring the arrival of your tiny prince? Then read on as we share some suitable cake recipes. You could declare the gender of your baby with a nice little cake, in blue! Add some vanilla frosting on the cake and spread it out evenly with the help of a spoon or knife. Mix some vanilla frosting with the blue color and put it in a zip lock bag. Pipe out this frosting on the edges of the cake into small balls. Microwave the fruit chews for no more than three seconds, till they soften. Press them together and roll them out into tiny feet. Use the jellybeans and cut them out into small ovals to use them for the feet. Use the dark chocolate frosting to write a small message on the right side of the cake. Replacing the traditional red velvet cake with a little blue velvet will be the perfect way to announce what’s in store! Yes, this one’s a baby shower cake for boy. In a baking pan, add butter over the surface and sprinkle some flour. Bring together sugar, eggs, and butter in a bowl. Paste together the food coloring and cocoa, and add it to the above mixture. Add salt and flour to the above and then toss in buttermilk and vanilla. Add the soda and vinegar. At this point just stir it once and do not whisk or beat hard. Once the cake cools down, add in some frosting. Know the lady is going to be mommy to two? Then why not have a cake which would make both the babies happy? This could get a bit tricky if you do not know if both the kids are boys, or girls, or a boy and a girl. So, you may have to be wise when playing this. We are suggesting a couple of cakes. The animals on top could help with the gender. In the case of two girls, you could use two pink bears and in the case of boys use two blue bears. If the mother is going to have one girl and one boy, then use one pink and one blue bear. The mum-to-be has many cravings and one of them is definitely chocolate! So, why not give her not one, but two reasons to be happy? Bake this yummy double chocolate cake and bring a smile on her lips! Take the 70% dark chocolate, cut it coarsely and put in a deep bowl. Heat some cream and pour it into the deep bowl to mix it well with the chocolate. Cover the mixture and leave it in the refrigerator for a while. In a bowl, mix sugar and almond paste together and stir in the flour. Add butter little by little and keep stirring. Next, add in the eggs one by one. To the above mixture add in cocoa and baking powder, along with melted chocolate (the 55% dark chocolate should be melted on a water bath at a low temperature). Mix the entire batter well and move into a baking tray. Bake it at 350ºF for about 20-25 minutes or until the needle comes out clean. Put the cake on a cake table and butter the cake evenly. Then add the ganache and white fondant. Make sure the surface is smooth and has no edges. Over this, place the two bears and add a few colored sprinkles. Refrigerate the cake for a while and take it out just before the party. Both lemons and coconuts are quite safe to be eaten, and their taste satiates your cravings. Preheat the oven to 350ºF. In a bowl, add vanilla and milk. In another bowl, add flour, baking powder, and salt. In a bowl, slightly beat butter for two minutes. Once done, add in sugar and beat until fluffy. To the bowl, add flour and milk mixture alternately. To this mixture, add three eggs and beat again. Take three nine-inch cake pans and sprinkle them with butter and flour. Add the above mixture to the cake pans and put them in the oven for 20-25 minutes or until a toothpick comes out clean. Mix one cup sweetened coconut flakes with two-third sour cream and one-fourth lemon curd. Add one tablespoon lemon zest and cover the mixture. Chill until it is ready to use. Take the softened cheese in a bowl and beat one and a half cups heavy cream into it. Add two teaspoons of pure vanilla extract and one-fourth teaspoon coconut extract. Whip the mixture until fluffy. To the above mixture, add in one-third granulated sugar and beat heavily. Add some whipped cream into the mixture and this should be used immediately. On a cake tray, put one layer of the cake and spread half the coconut-lemon filling. Leave one-fourth inch border all around. Place the second layer of cake and do the same. On the third cake layer, spread mascarpone frosting. Add the frosting to the sides of the cake as well. Add the chocolate babies on top and put some rainbow sprinkles. Cake is definitely the star of the show. But add in a couple of cupcakes, and the party turns magical. We’ve got some of the best baby shower cupcakes you could have ever tasted! Munch on! Cupcakes are yummy and easy to eat. Having a few cupcakes helps bring in a variety in the tiny menu of a baby shower. Plus, you have the added advantage of not spending too much! So, below we give you some tasty and interesting cupcake recipes. This is one of the funny baby shower cupcakes; it comes with feeding bottle on the top. Cream together the butter and castor sugar till it forms a pale, fluffy mixture. Add eggs one by one and beat the mixture between each addition. Add vanilla extract to the mixture. Line 10 or 12 muffin case holder with paper cases. After stirring the mixture well, spoon it into the paper cases. Put the cupcakes tray in the oven for about 25 minutes. At the end of baking, check if the spoon comes out clean and the muffins are golden brown. Once the cupcakes cool, start decorating them. Sprinkle some icing sugar on the work area and roll out icing sugar till it is 5mm thick. Cut out discs of the icing as big as the top of the cake. On the top of the cakes, put some warm jam and then place the cut icing there. To make the baby bottles, add either blue or pink colors to small balls of icing and roll them together. Once the balls take the desired color, place them on the cupcakes. You could use some water to stick the bottles. Tip: You can use both colors if there is a twin baby shower with the mother expecting a boy and a girl. Make half the batch of cupcakes pink and the other half blue. Presenting a bouquet is a lovely gesture. But presenting a cupcake bouquet? It’s great! Use a wooden spoon to mix butter and sugar together. Break the eggs one after the other. After the eggs have been whisked with the batter, the batter should be a little runny. Add baking soda and flour to the mix. The batter may have a few lumps, so beat the batter faster. Pour the batter into cupcake molds lined with paper and bake for 25 minutes. Using icing, color the cupcakes with different colors. You could also use colored sprinkles over the icing. To a few cupcakes, add flattened sugar drops. On a large white plate, draw small flower stalks using the green icing. They shouldn’t cover the entire length of the plate. Use pink or yellow icing to draw leaves closer to the stalks. Decorate the cupcakes from where the stalk ends (on the upper side). Kids love campfires. And having a baby reminds mothers of how they were as kids. This cupcake recipe is sure to take you back in time! Line 24-muffin case holder with paper cases. Add flour, baking soda, salt, and baking powder in a bowl and put it aside. In another small bowl, dissolve cocoa in hot water. Beat shortening in a bowl (with an electric beater) and add sugar as you beat. Add eggs one at a time and beat after each egg is added. Add vanilla and one-third of the flour mixture. Beat on low speed. Add half the cocoa mixture. Fill the muffin tray with the batter and bake for about 25 minutes. Cool the pancakes for 25 minutes. Heat the marshmallows a bit until they semi-melt. Place a cooking paper over marshmallows in a microwave tray and heat them for about 10 minutes. Once the marshmallows cool down, add the lemon icing on top. Place the semi-melted marshmallows on the icing. You can also choose to not melt the marshmallows and place two small ones on each cupcake with the help of toothpicks. Fancy, cute, and unique baby shower cupcakes are always welcome. They wouldn’t just be pleasing to the tongue but also appeal to the eyes. Mix baking powder, baking soda, flour, butter, granulated sugar, and salt in a large bowl. To the bowl, add eggs, one cup of milk, vegetable oil, and two teaspoons of vanilla essence and beat until the mixture is fluffy. Fill the cupcake molds with the batter. Bake for around 20 minutes and then let the cupcakes cool for around 25 minutes. For the frosting, take a bowl and beat the butter till it is fluffy. Then add powdered sugar, one teaspoon vanilla essence, and the remaining milk. Add the frosting to the cupcakes in very small quantities. Take the chocolate candies and place them at one end of the cupcakes. Take a marshmallow and cut it out like fur on a sheep. You could do this by running the knife in a pattern, without touching the base of the marshmallow. Place the cut marshmallow on the cupcake. Make many eyes and ears by cutting the marshmallows into smaller pieces. Place the eyes over the chocolates and the ears at the sides. For the black eyeballs, use melted dark chocolate. These lip-smacking recipes impress the mother-to-be and your guests too! But that’s not all. Check out the next section! If we have the cakes covered, you should be writing something on them, right? From sweet to cute to adorable, we’ve got it all here. Check out our collection of baby shower cake wordings for baby boys, girls, or both! Soon you will have someone to spoil!! Bibs and diapers, and tiny blankets and pins! This is how our new life begins! The baby is almost here!! Mum-to-be can’t see her feet! Boy or girl, we will just twirl! A giggle, a toy, a sweet baby boy! 4 feet, ready to spring and run! and guess what? Half the sleep for everyone! Give a twirl, for our precious girl! Could it get any merrier? The big day is drawing near,The baby is almost here! 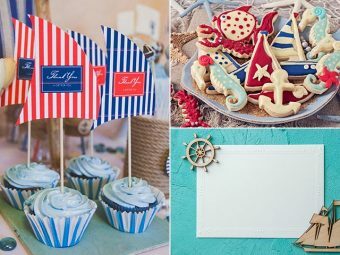 Now, we’ve got your baby shower party covered! Try out these amazing recipes for the mother and the guests and have a fun time. Tell us which recipe you like the most. Also, feel free to share more recipes. 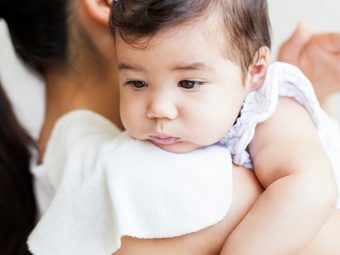 Why Do Babies Choke And How To Prevent It? 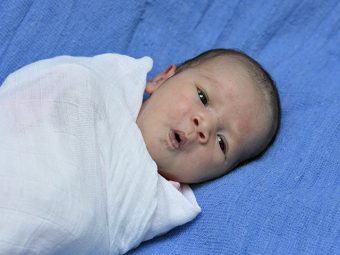 How And When Should You Stop Swaddling Your Baby?